You are currently browsing articles tagged Edwin Rian. Our post today is a repeat from 2012. Since that time, a very interesting article by James W. Scott has appeared in the Westminster Theological Journal. In this article, “Machen’s Lost Work on the Presbyterian Conflict,” Mr. Scott explores the possibility that J. Gresham Machen had been at work over the summer of 1936 writing a book on the Presbyterian conflict. Among Machen’s papers, the working notes and manuscript for that book were never found, and Mr. Scott builds his case for the theory that the work was removed from Machen’s estate after his decease by Edwin H. Rian and later used as the core of the book later published by Rian, titled The Presbyterian Conflict. Westminster Theological Seminary has graciously posted the first part of this article to the Seminary web site, here. I think you will enjoy reading the article. I was frozen in place that day behind the front desk of the Christian conference center in New Jersey. The distinguished man had walked up to me to ask whether the Director of the Conference was on site. I replied that he was away at the time. Whereupon the man gave me his business card, and walked out of the hotel that summer afternoon in 1965. Looking down, I read the name of “Edwin Rian, Assistant to the President, Princeton Theological Seminary, Princeton, New Jersey.” I wish that I could say to our readers that this young seminarian had then rushed out of the hotel to ask the writer of the historic book The Presbyterian Conflict to stop and talk. I wish that I could say to our readers that I stopped him and discussed with him as to why he left the infant Orthodox Presbyterian Church after such a valiant stand against the apostasy of the Presbyterian Church, USA. I could have asked him whether he remembered my father, who stood with him in the nineteen thirties for the faith, by faith. But I did none of these things. I was frozen in time. Born in Minneapolis, Minnesota, Edwin Rian came to Princeton Theological Seminary to study Semitics at the prestigious school., as part of the Seminary’s class of 1927. Ordained in 1930 in the Presbyterian Church in the United States of America, he advanced his scholarship by studying as a Princeton Fellow at the Universities of Berlin and Marburg in Germany. Returning to the States, he saw clearly the issues which led his mentor J. Gresham Machen to organize Westminster Theological Seminary. He took his stand on those same issues, and like Machen and a number of other ministers, was censured by the Presbyterian Church, U.S.A. As a founding member of the Presbyterian Church of America (1936), he stayed with that church when the Bible Presbyterians left it in 1938. The former was later renamed the Orthodox Presbyterian Church. (1938). It was in 1940 that Rian crystallized the issues by writing the important book, “The Presbyterian Conflict.” It still can be found in print or online, and is quoted often by those who seek to understand this period in American Presbyterian history. Something happened to Edwin Rian himself, though, in the latter part of the 1940′s. The fact that he left in 1946 to join the Christian University Association as its General Secretary was not unusual. What was unusual was that on April 25, 1947, he left the Orthodox Presbyterian Church to reenter the Presbyterian Church, U.S.A., from which he had been suspended over ten years before. Various reasons had been suggested for this, sea change. One theory was that Rian was disappointed that a Christian University had not been started in Reformed circles. And certainly, the rest of his life and ministry was taken up in educational circles. But that reason doesn’t ring true to this contributor. The reasons, however, were never revealed. 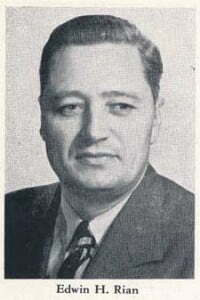 He went on to serve in a variety of administrative posts in colleges and universities like Trinity University in San Antonio, Texas, Beaver College in Jenkintown, Pennsylvania, Jamestown College in Jamestown, North Dakota, Biblical Seminary in New York City, New York, and the American Bible Society in New York City. His last ministry and one in which he came full circle, was the position of Assistant to the President of Princeton Theological Seminary, Dr. James I. McCord, where he served for 15 years until his retirement. He departed this life in 1995 at age 95 in San Diego, California. Words to Live By: Jesus said in Luke’s Gospel, chapter 6:62, “No one who puts his hand to the plow and looks back is fit for the kingdom of God.” The commentator writes that there are some whose hearts are in the past. They walk forever looking backwards and thinking wistfully of the good old days. The watchword of the Kingdom servants is always “forward,” never “backward.” Let us be not be content with lukewarm service.